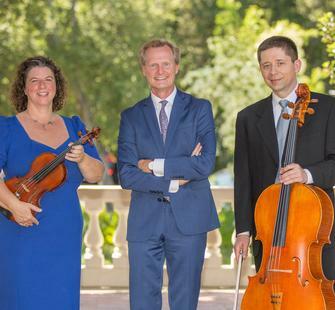 Join us in the historic Villa for Sunday afternoon concerts with the Saint Michael Trio! The Saint Michael Trio (Russell Hancock, Michel Flexer, and Robin Sharp) is hailed as Silicon Valley's update to the staid world of classical music. They receive praise for making their concerts interesting, accessible, and oftentimes funny. In addition to the classical masterworks, they perform jazz and even rock tunes, and their hallmark is mixing all of it in the same concert.